We're just back from a fabulous few days on Olkhon island, the largest island on Lake Baikal. We stayed at Olga's guesthouse, where we enjoyed enormous portions of home cooked food. The island is a tourist haven in the summer but at this time of year is fairly deserted. The main town felt a bit like a film set for a western, made up of ram shackled wooden huts and houses. We were lucky enough to have two days of glorious sunshine although the lake was still partially frozen, which made for an impressive contrast with the golden sandy beach. 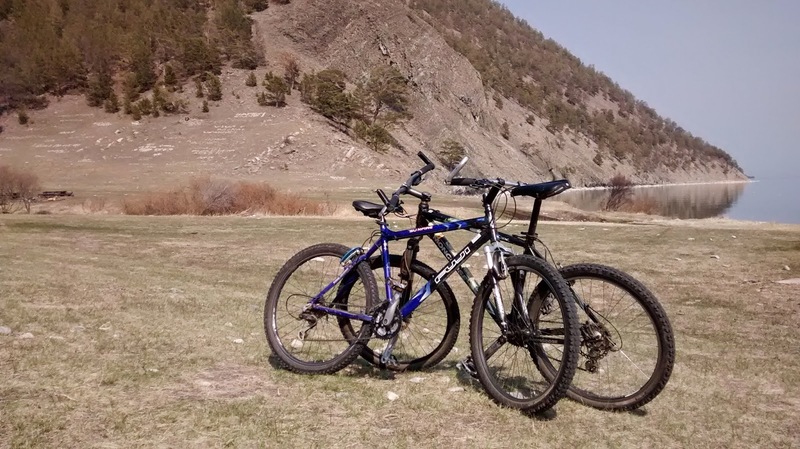 The island is a great place for hiking and cycling so we decided to get back in the saddle - this time mountain bikes rather than horses. Now, before continuing, let me give you a bit of background to my cycling career: I was the last person is my class to learn to ride a bike, in fact it was such an event that the whole neighbourhood came out to watch when my stabilisers eventually came off. To cut a long story short, I'm not a natural cyclist. We chose a 50km route across the island, over some rolling hills (which felt like mountains), through forest and alpine meadows. It was tough. I had to push my bike more than halfway up the first hill and it didn't get much easier. I'd like to blame it partly on the fact that I had a bike that was far too big - which made uphill particularly difficult and downhill particularly terrifying - but I'd just be making excuses. Julian didn't have to push once. It was only when I went over a steep summit and slammed on the back brake only to have my back wheel jump off the ground that I realised the brakes were the wrong way round - nobody told me that it's only in the UK that the back brake is on the left. Did I mention I'm not a natural cyclist!? Physical challenges aside, it was a great day. The highlight was the halfway point, where the track meets the shore of the lake on the Bolshoi Sea side of the island. It was an eerily beautiful spot because the lake was perfectly calm and it was impossible to distinguish the water from the sky, meaning it looked a bit like the edge of the world. On our second day we were reunited with the 'Soviet Jeep' for a tour of the northern cape. Our guide was an old Russian man who cooked us fish soup and served his wife's delicious fresh tomato salsa for lunch. We finished off the trip with a banya - similar to a sauna - which is an important part of Russian life, particularly in winter when the temperature on the island hits -30 degrees. Nine time zones, no jet lag!